European Commission President Jean-Claude Juncker (C) speaks next to EU chief Brexit negotiator Michel Barnier (R), during a debate on UK’s withdrawal from the EU during a plenary session at the European Parliament. 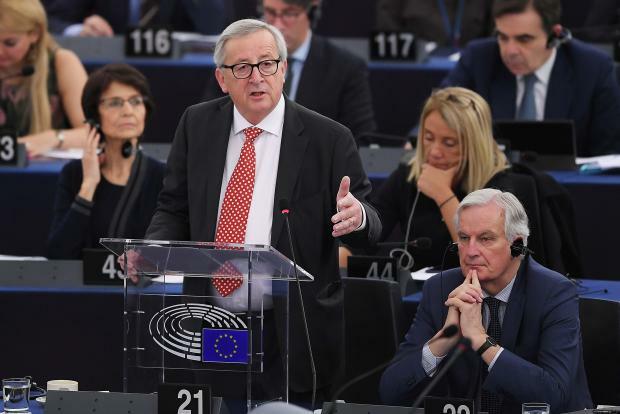 European Commission chief Jean-Claude Juncker said Tuesday the European Union can focus unhindered on building its own future now that Britain has a longer delay to work out its troubled exit. "Brexit cannot and will not hinder our progress," Juncker said, adding the delay agreed at a summit last week will mean Europe will not be forced to discuss Brexit every week. Echoing terms of the delay the EU granted Britain at a summit last week, Juncker also underlined anew Britain's role in the months or weeks ahead. "We are requesting there will be a loyal and responsible cooperation," the former Luxembourg premier said, switching to English from a speech in French and German. But Juncker also said Britain must be treated as a full member as long as it stays in the block. "We don’t have member states of second rank." The April 12 deadline was a delay from an original deadline of March 29. The EU granted the delays after Prime Minister Theresa May failed three times to get her parliament to adopt the divorce deal she struck in Brussels in November. The deal also means that, if London remains in the EU after May 22, British voters will have to take part in European elections - or crash out on June 1. Juncker underlined the options facing Britain. "The United Kingdom can also revoke its request to leave, but it is not my working hypothesis," Juncker said. "Nor is it my working hypothesis that there will be an other extension beyond October 31."